I was deeply saddened to learn this morning that Hayabusa (real name Eiji Ezaki) passed away today at the age of 47. Few fans under the age of 30 likely know the name, but anyone who watched international pro-graps during the 1990s remembers Hayabusa as one of the most spectacular junior heavyweights of that era, mixing outstanding high-flying maneuvers with solid Japanese-style in-ring psychology. 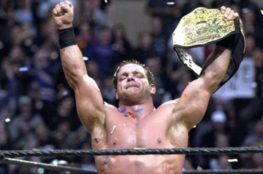 Devastatingly, in 2001, he slipped on a “routine” springboard moonsault (known otherwise as the “Lionsault” which Chris Jericho uses to this day) and broke his neck, leaving him paralyzed and confined to a wheelchair. Although he finally managed to walk again last year with the use of a cane, the amazing performer die-hard wrestling fans knew and loved was never the same after that tragic day nearly 15 years ago. I make mention of Hayabusa for two reasons. First, as an avid collector of pro-wrestling video tapes in the 1990s and early 00s, he was one of my favorites. I was privileged in August 1998 to drive down with one of my best friends to Dayton, Ohio and watch him perform at Extreme Championship Wrestling’s Heatwave 1998 Pay-Per-View. (For those interested, the event is available on the WWE Network and I can be clearly seen throughout on the far left of the screen sitting in the second row.) Heaven only knows where his career would have gone had he avoided injury, but he left behind a body of work that still inspires pro-wrestlers to this day. Second, and more importantly, Hayabusa’s injury should serve as a reminder to all of those who deride pro-wrestling that the sport is dangerous. Even “routine” or “casual” moves can lead to devastating consequences if executed poorly or something as “simple” as a slip-of-the-foot occurs. People who decry pro-wrestling as “fake” have no idea what they are talking about, and the price Hayabusa paid to be among the top talents in the world is proof positive of that. I haven’t the foggiest idea why Hayabusa got into the world of pro-wrestling or what he hoped to get out of it. But I have no doubt, after watching him in the ring for years, that he loved and dedicated himself to the craft which ultimately cost him everything. Requiescat in pace. Gravity is real, no matter how staged the combat is. Not to mention too many kids and fans get sent to the emergency room (or the funeral home) trying to copy wrestlers.